In recent years, a diverse range of major disasters have occurred: earthquakes, tsunamis, floods, volcanic eruptions, pandemics, food shortages, to name but a few. The cost of such disasters is enormous – not just in terms of human lives, but also in terms of the cost to the economy. Shocks on this scale can set back the performance of a national or regional economy by months if not even years. Work at OECD on risk management issues points to the crucial importance of early risk identification and early warning. And this is where science and technology come into the picture. They have a vital role to play in deepening understanding of risk factors, in detecting the impending disaster, in mapping its possible consequences, and preparing the terrain for the emergency response. Space technologies (Earth observation, telecom, navigation, positioning, and timing), combined with information and communication technologies can assist in the surveillance of major threats today and in the near-to-medium term future. 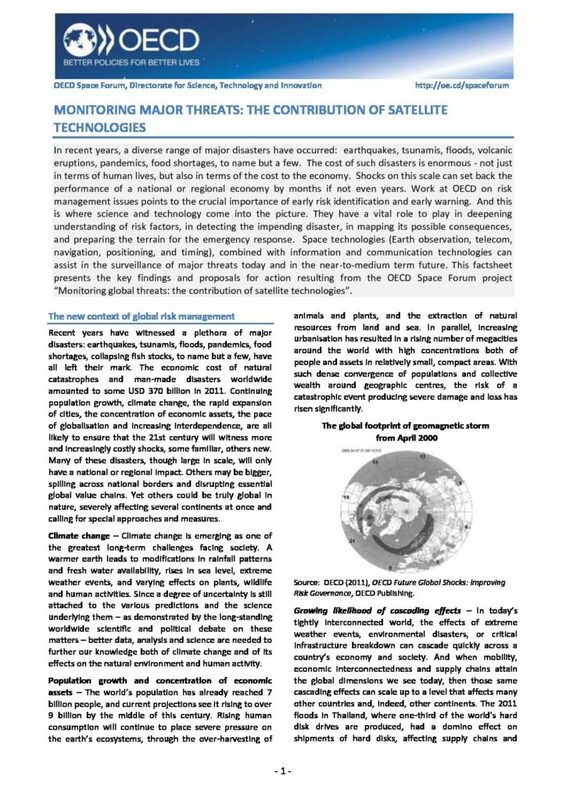 This factsheet presents the key findings and proposals for action resulting from the OECD Space Forum project “Monitoring global threats: the contribution of satellite technologies”.